The Securities Industry Essentials (SIE) exam tests your knowledge of what to do after you’ve opened a new account. You have to follow additional rules and regulations to keep working in the business. You need to know how to receive trade instructions and how to fill out an order ticket, as well as settlement and payment dates for different securities. When you’re working as a registered rep, completing documents such as order tickets will become second nature because you’ll have them in front of you. When you’re taking the SIE, you don’t have that luxury, but you still need to know the particulars about what to fill out. The figure shows you what standard paper order tickets may look like. Buy and sell order tickets have spaces for the info you need to make a trade. Normally, you’ll be recommending securities in line with a customer’s investment objectives. If, however, the customer requests a trade that you think is unsuitable, it’s your duty to inform him about it. You don’t have to reject the order (it’s the customer’s money, and you’re in the business to generate commission). If the customer still wants to execute the trade, simply mark the order as unsolicited, which takes the responsibility off your shoulders. Principals are managers of a firm. All brokerage firms must have at least two principals (unless the firm is a sole proprietorship). 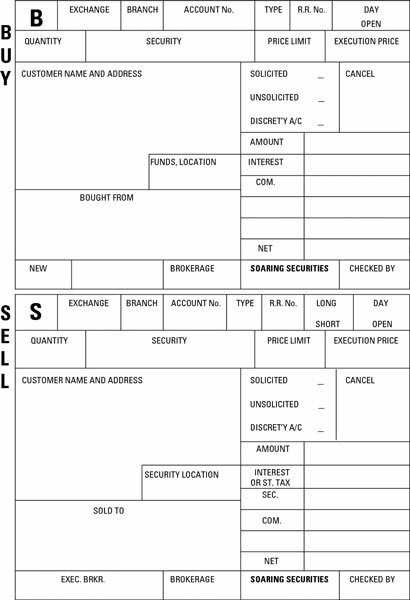 When you open or trade an account, you have to bring the new account form or order ticket to a principal to sign. Principals need to approve all new accounts, all trades in accounts, and all advertisements and sales literature; they also handle all complaints (lucky break for you! ), oversee employees, and watch for potential red flags. A principal doesn’t have to approve a prospectus or your recommendations to your customers. Although you’ll generally bring an order ticket to a principal right after taking an order, the principal can sign the order ticket later in the day. If you’re questioned about this on the SIE exam, you want to answer that the principal needs to approve the trade on the same day, not before or immediately after the trade. Members or associated persons are prohibited from sharing in the profits or losses in a customer’s account. An exception to this rule is if the associated person contributed to the account. In that case, the associated person needs a written authorization from the customer and principal, and the profits and/or losses are shared by the customer and associated member based on the percentage contributed. Exempt from the rule of proportional sharing are accounts of immediate family (parents, mother-in-law, father-in-law, spouse, or children) of the associated member. Trade date: The day the trade is executed. An investor who buys a security owns the security as soon as the trade is executed, whether or not he has paid for the trade. Settlement date: The day the issuer updates its records and the certificates are delivered to the buyer’s brokerage firm. Payment date: The day the buyer of the securities must pay for the trade. Unless the question on the SIE specifically asks you to follow FINRA or NYSE rules, assume the Fed regular way settlement and payment dates as they appear in the following table. The FINRA and NYSE rules both require payment for securities to be made no later than the settlement date, but the Federal Reserve Board states that the payment date for corporate securities is five business days after the trade date. Cash trades (which are same-day settlements) require payment for the securities and delivery of the securities on the same day as the trade date. In certain cases, securities may not be able to be delivered as in the preceding chart. In these cases, the seller may specify that there’s going to be a delayed delivery. There can also be a mutually agreed upon date in which the buyer and seller agree on a delayed delivery date prior to or at the time of the transaction. According to Regulation S-P, broker-dealers, investment companies, and investment advisors must “adopt written policies and procedures that address administrative, technical, and physical safeguards for the protection of customer records and information.” This means that members must provide a way for securing customers’ nonpublic information, such as social security numbers, bank account numbers, or any other personally identifiable financial information. Members must provide customers with a notice of their privacy policies. Members may disclose a customer’s nonpublic information to unaffiliated third parties unless the customer opts out and chooses not to have his information shared. Members must make every effort to safeguard customers’ information, including securing computers, encrypting emails, and so on.